More than 6 million people worldwide are unable to speak or move because of severe physical disability, such as cerebral palsy or motor-neuron disease. Often their cognitive abilities are ok, leading many to live a life trapped inside their own body. In fact, people with profound disabilities and their carers have to go to extreme lengths in order to communicate, and in many cases they cannot communicate at all. The New Zealand-based startup Thought-Wired is determined to give people unable to communicate a voice. 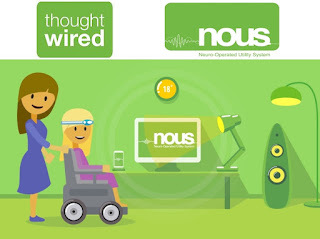 They have developed a device called nous, a brain-sensing technology that do not require any movement or speech. The device is a lightweight headband that detect the user’s brain activity and translates them into signals. Their software is then able to interpret those signals and turn them into actions. This let users learn how to control their thought patterns, enabling them to select words and images on a computer screen or smartphone. For example, the system starts with simple actions like choosing between ‘yes’ or ‘no’, and progresses into choosing what they want to eat or what TV channel to watch. The startup envision that it could progress into allowing users to answer emails, use social media and even interact with the physical world by for example turning lights off or on. Number of different technologies on the market target people who have a severe disability in hope of assisting them communicate. While these are highly innovative solutions, they still require some form of physical ability, whether it is through eye gaze trackers or infrared cameras, to communicate. However, many people do not have reliable physical abilities to use these solutions. Thought-Wired’s nous on the other hand do not require any physical ability at all, potentially increasing access to new communication tools for millions around the world. Many people who is unable to communicate feel frustrated, angry and depressed due to the isolation, and in trials the device has shown to dramatically improve quality of life for users. It give people with disabilities an opportunity to communicate with their surroundings, be heard, not only feel included in a conversation but in society. Not to mention the effect it could have on family, friends and caregivers. The startup is already delivering their vision of a world where everyone can communicate regardless of disabilities. 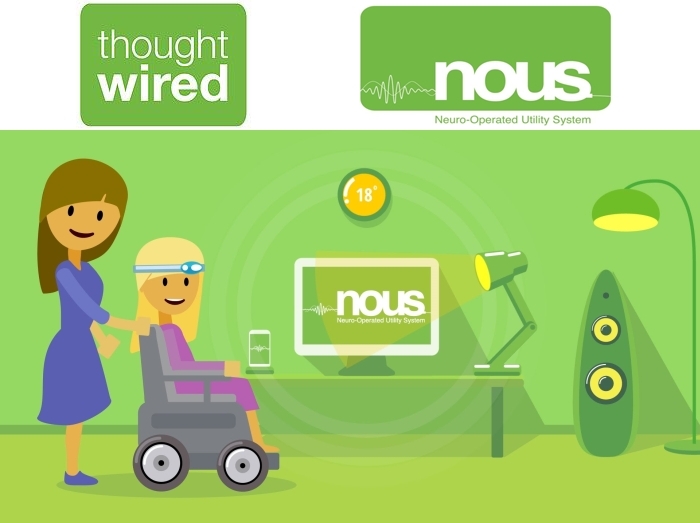 Thought-Wired has successfully trialed the first version of nous, and is ready to commercially launch the device in early 2017. The device will be available through a subscription model and cost $199 per month. Previously the startup has been part of the Akina Launchpad accelerator, focusing on ideas that could have a big impact on social or environmental problems, and they were the 2016 overall winners of The Everywhere Initiative by Visa. In September 2016, Thought-Wired raised funds via the New Zealand crowdfunding platform PledgeMe, and raised well over their target of $200,000.